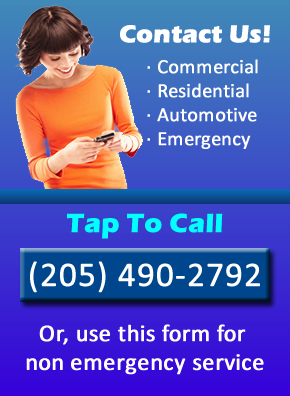 (205) 490-2792Call Us Now For Fast, Affordable Help In The Birmingham Area! Getting your locks replaced or repaired is always a good idea, particularly if you have experienced a recent burglary or are worried about who might have access to your house keys. The security of you and your loved ones is of paramount importance, and ensuring the security of your home goes a long way to keeping them safe. When you decide to have your locks replaced or repaired, you need to give Locksmith Birmingham a call. Locksmith Birmingham is the premier Birmingham residential locksmith service, providing replacement and repair work for many satisfied customers over the years. If you have recently moved into a new home or condo, you should consider the benefits of changing the locks – you never know who might still have a key. If you have lent house keys that have been lost, or if people such as former lovers have access to your house keys, you definitely need to think about safety and consider replacing the locks. Whether it is an emergency situation or you simply want to schedule an appointment, contact Locksmith Birmingham anytime to get your locks replaced and repaired. We are happy to perform any related service from a simple repair of a broken lock to a full house security upgrade and lock replacement. Our expert service is guaranteed to satisfy, and we work quickly to get your house up to your exacting security standards as soon as possible. We pride ourselves on our speed and efficiency, as well as our expert work. Whether it is replacement you seek, a lock repair, or a new lock installation in Birmingham, contact us today to find out more about how we can help you feel more secure inside your home and in your life.